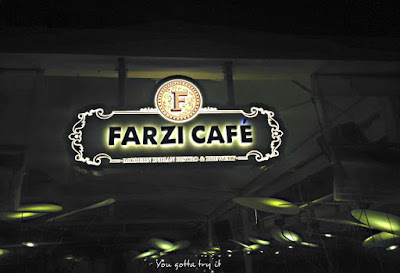 Farzi Cafe, a modern Indian Bistro which is brainchild of Mr.Zorawar Kalra who is the son of celebrity Chef, Jiggs Kalra. This brand from the Massive Restaurants Group, doesn't need any introduction as it is already a popular name in cities like Mumbai, Gurgaon, Delhi and Dubai. This was my second visit to Farzi Cafe, UB City after the launch. 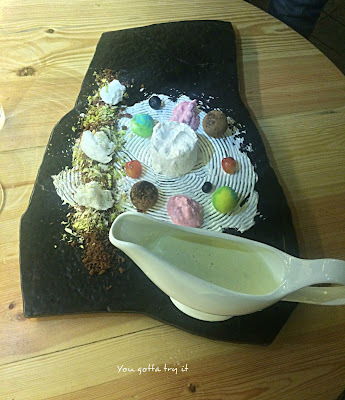 At Farzi they believe in creating an illusion. 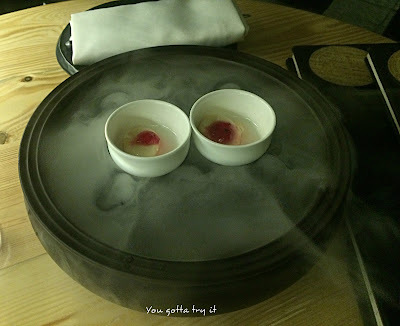 Every dish they create comes with a twist and molecular gastronomic techniques are applied. 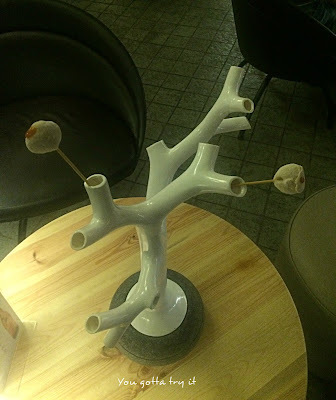 When you are at this Bistro Cafe, your experience will not be just fine; it will be an extraordinary one. With the modern, quirky interiors and the lighted walls, ambience is spectacular. 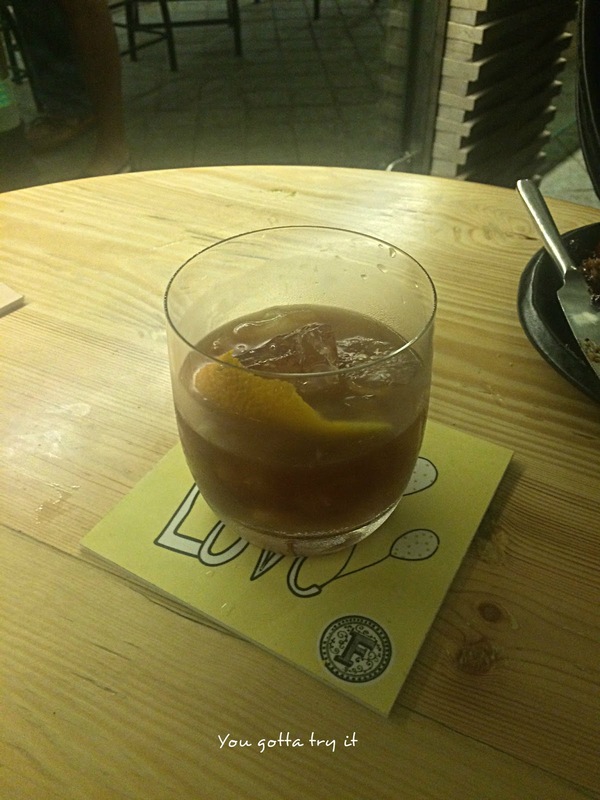 Staffs at Farzi are very friendly and attentive. They will help you to choose the right stuffs. 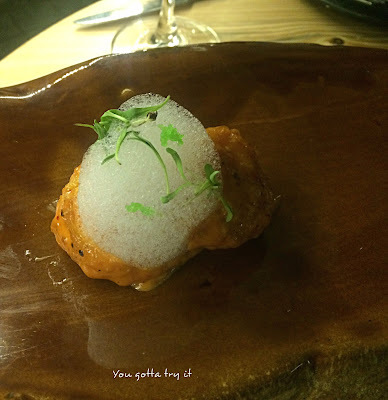 We started off with an Amuse Bouche which actually amazed me. The Bengali special Mishti Doi with Strawberry compote. 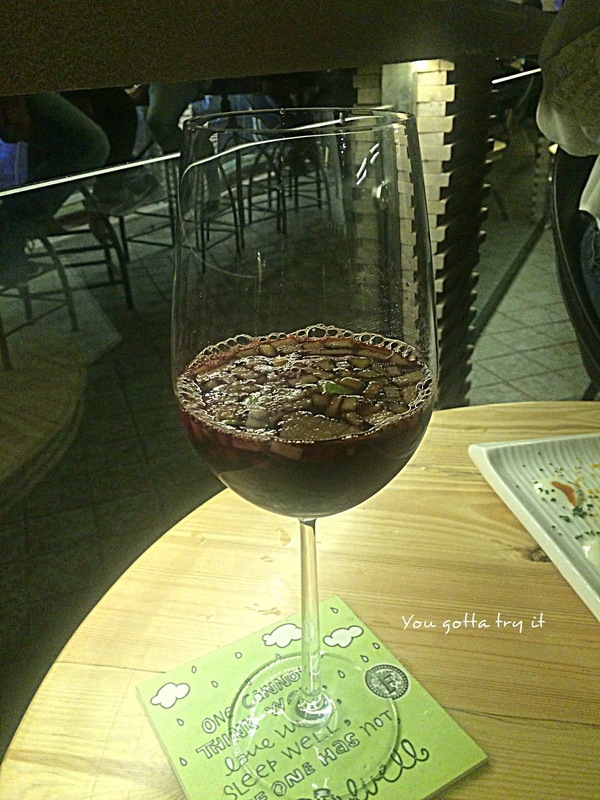 Soon after Amuse Bouche we placed the order for few Farzi special drinks. 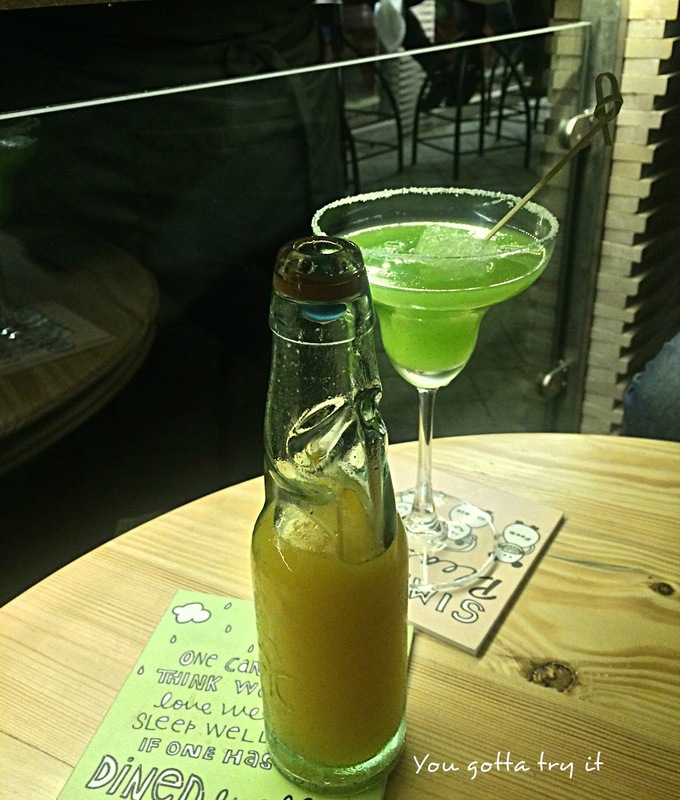 Banta cocktails comes in a nostalgic old fashioned Goli soda bottle. Though they have different flavors available, I opted for Vodka with Aam panna (raw mango drink), which was too good. If you love Aam panna you could also try the Chuski Margarita which is Tequila based drink. 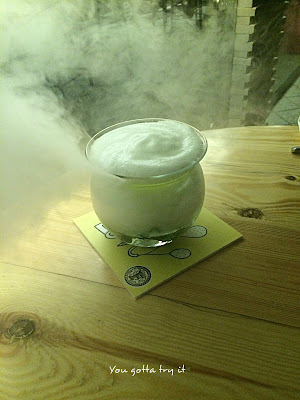 Farzi idea was cool as it sounds with two of my favorite elements- Vodka and Pineapple juice. 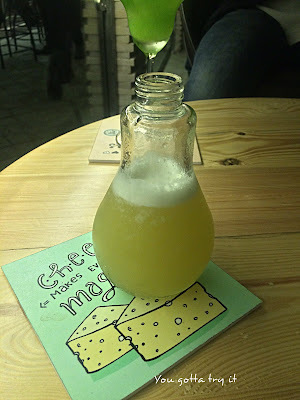 This refreshing cocktail was served in a cute bulb. Apple Foamintini - Vodka shaken with muddled granny apple, lime juice and elder flower syrup, with in-house mint foam and served on a cool Martini Chiller. Serving of Apple Foamintini was fun to watch as they used the molecular gastronomic technique and the smoky effect surely caught the attention of other diners. Three Musketeers - Bourbon mixed with Orange liqueur, Chocolate, green chilies and homemade bitters. 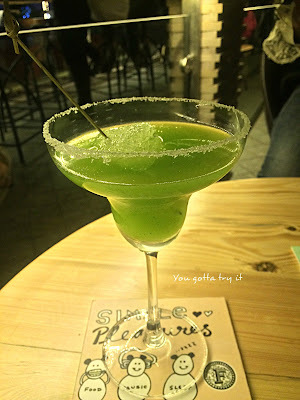 Though it had few sweet elements, this drink was bit strong for my taste. No drinks are complete without food. 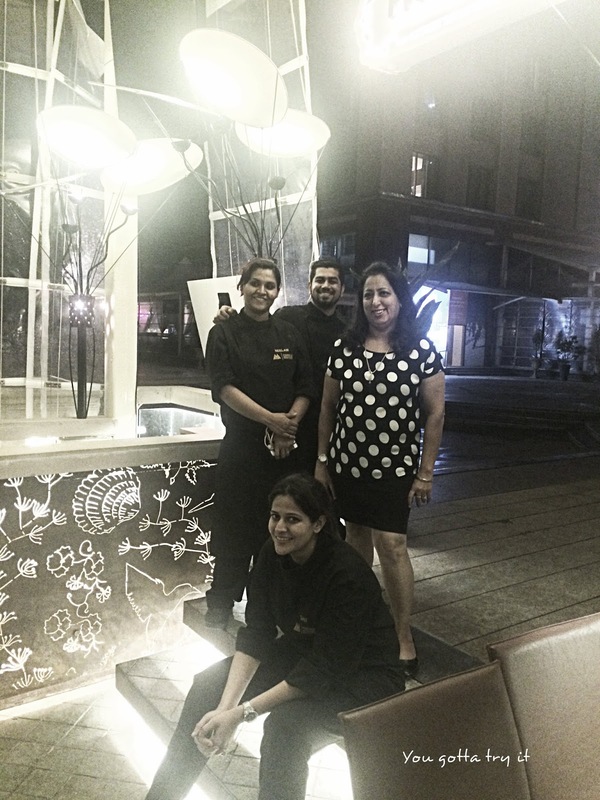 Chef Gaurav and Neelam helped us in selecting the dishes. While we were relaxing with our drinks we got some really yummy food as starters and main course. 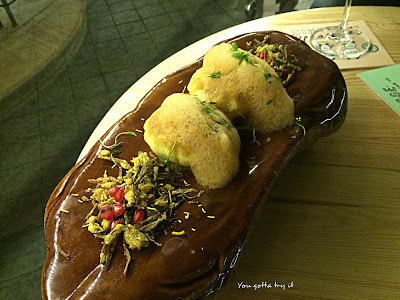 Mini Raj Kachori with crispy Okra salad and chutney foam - Farzi Cafe's Mini Kachoris were totally different from the regular kachoris. 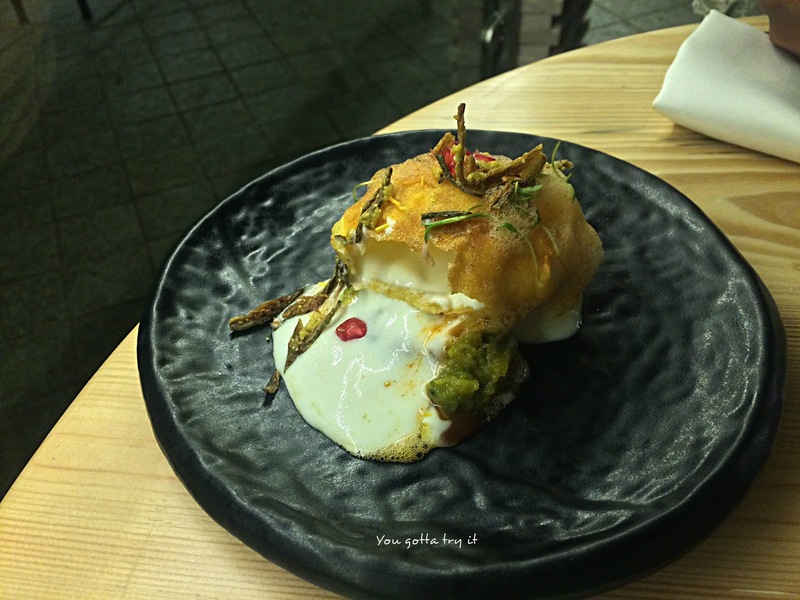 With the crispy okra salad, pomegranates, yogurt filling and chutney foam, this Kachori was truly delectable. Tempura Fried Prawns with Nimboo Mirch Air - Never miss this crispy and yet soft inside tasty Prawns Tempura with a lemony foam and fresh herbs on it. This Jumbo prawns will surely win your heart. Dal Chawal Arancini with Achar (pickle), Pappad and Chutney - Farzi has given a new dimension to the staple food of Indians- Dal Chawal with a modern twist to it. 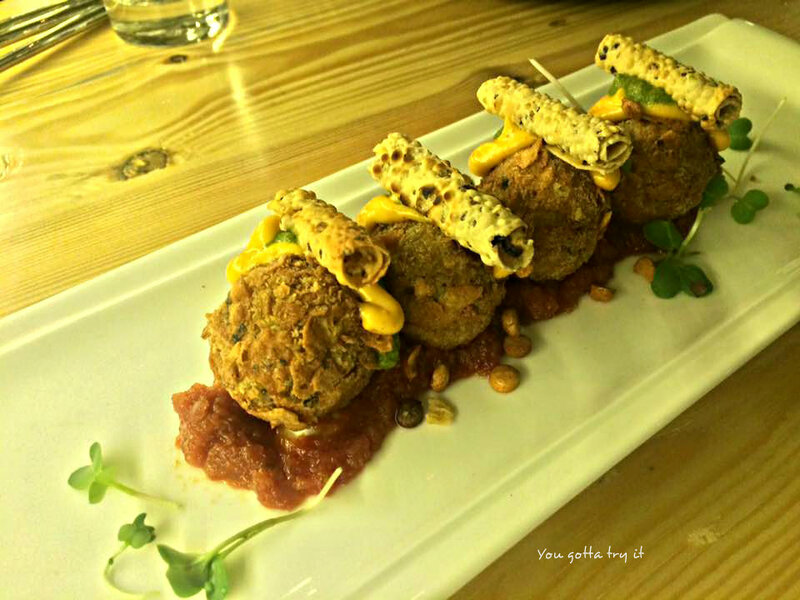 Sicilian Arancini balls are made out of simple Dal chawal and served with Achar, Chutney and rolled pappads. 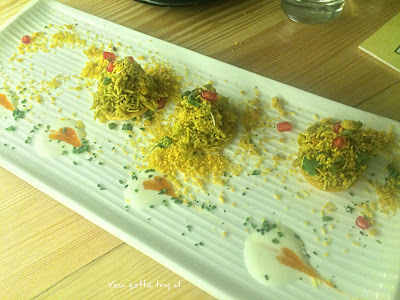 Bombay Bhel - The classic chaat from Bombay/Mumbai. 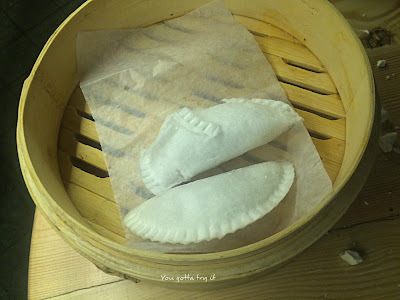 I must say freshness of each ingredient used were really good. The crunch from the pomegranate will enhance the flavor of this chaat. 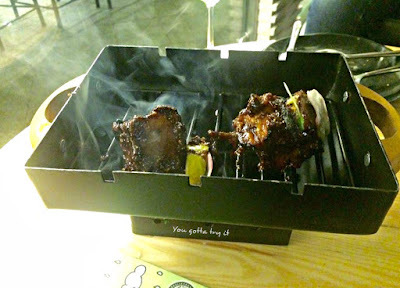 Delhi Belly Tikka with roasted Russet Apples and Murraba glaze - I was not sure about this dish as I am not a Pork lover. 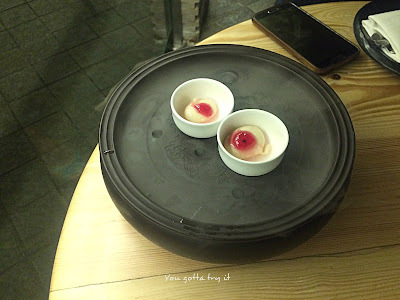 But the texture, aroma and presentation of this dish made me crazy. So within seconds, I just grab a piece of yummy pork belly. The sweetness from the Murraba gave a nice feel to the char grilled tikka. 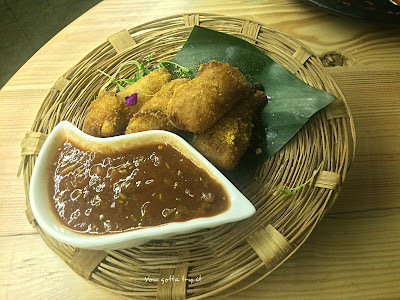 Besant Nagar Fried Chillies, Tamarind and Chilli Salsa - For a South Indian, chilli fritters are very special and it will never be spicy enough. Farzi special batter fried chillies with Tamarind and Chilli Salsa was a good choice for the evening. 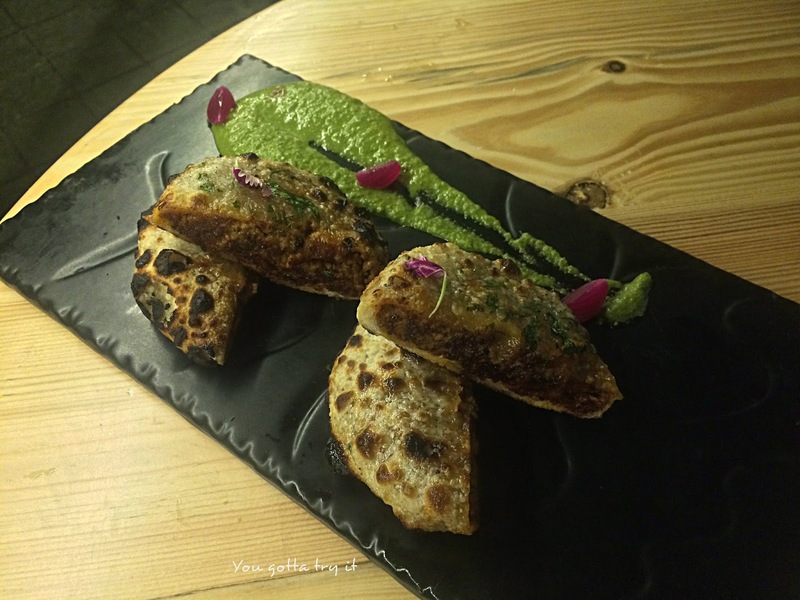 Kheema Kulcha - These kulchas stuffed with a spicy kheema was too good. Kulchas were cooked to perfection, not very soft or not very hard and the stuffing went well the green chutney. One will not need any other side dish to have this Kulcha. 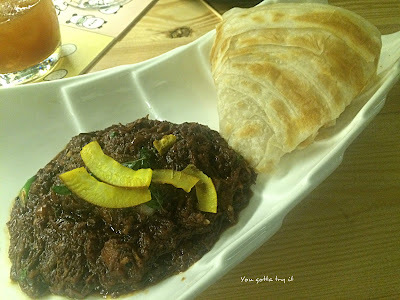 Mutton Erachi Pepper Fry with Malabari Paratha - Oops... its 'Porotta' what we call in Kerala. Porotta which was crispy and flaky served with the best combo available; Mutton Erachi Pepper fry. I loved the typical Kerala flavors from the dish, but it could have been a bit spicier. Chicken Tikka Masala with Assorted Indian breads- Along with the scrumptious dishes I love the servewares too at Farzi Cafe. Everything was so unique and attractive. Next dish caught my attention for the same reason. 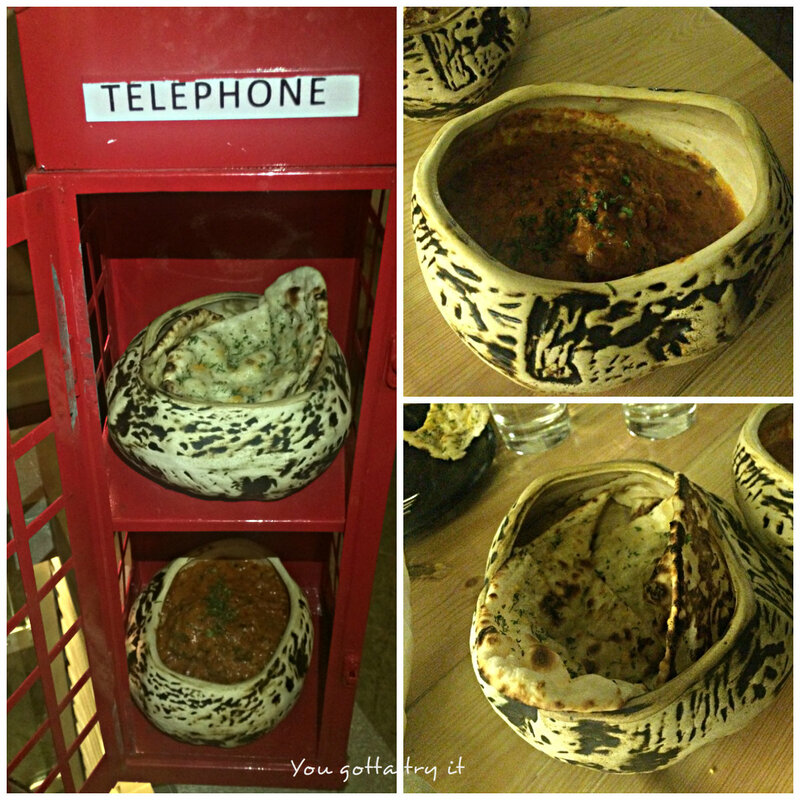 Chicken Tikka Masala and Assorted breads (Naan, Tandoori Roti) were served on a colorful Telephone booth. Sorbet Lollipops - When you order this, you will notice that one by one other table diners also will start ordering these tiny little beauties. Sorbet lollipops are palate cleanser and at Farzi you get different flavors of these. Red Wine Sangria- I finished off my main course with a glass of Red wine Sangria. Milky Way Big Bang- I was flabbergasted when this mini version of Galaxy was presented in front of us. The dessert consisted of center white piece as Sun which was an Orange mousse surrounded by other planets made of chocolate truffle, white chocolate coconut balls and many more. When Chef Neelam explained us about the dessert we were patiently waiting to taste it. 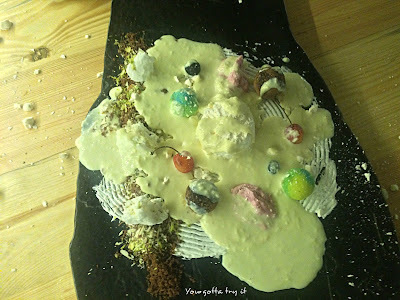 When she poured the white chocolate sauce on top of the dessert, it just reminded me the Anna's mess created by Chef Anna Polyviou in this season's MasterChef Australia. Gujiya paan- After a feast, when we thought we are done with the dinner, the steward came with a dimsum box which contained mouth freshener. To my surprise, this Gujiya paan was made of Cotton candy with paan stuffing. What a great way to end a wonderful dinner! My thought on Farzi- When you absolutely love something, words won't be enough to describe it. 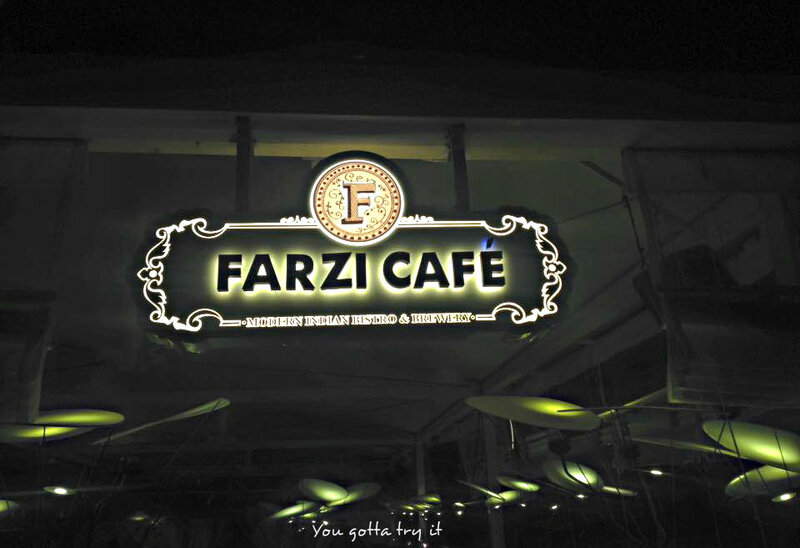 Happy news for Bengalureans is that Farzi Cafe is now open from 12 PM onwards. 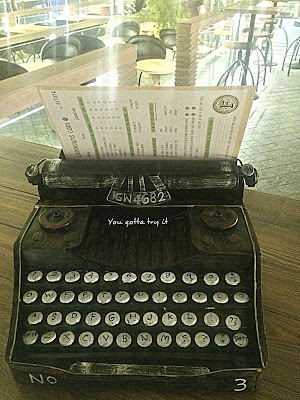 Check out this place for an enjoyable dining experience. A special thanks to Rekha Ghosh, Chef Neelam, Gaurav Sircar, Tanvi, John and Divya Dalwani for making my evening so special. I would be happy to visit again soon to explore more dishes. 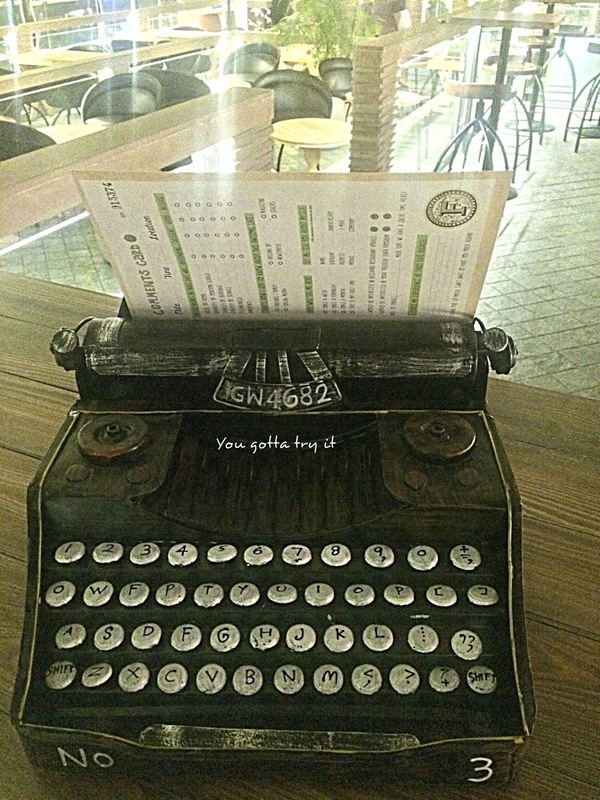 A meal for two would be ₹1500 (approximately).